It's going to be Halloween soon and my son wanted a card with skeleton! So here is a card I made with a skeleton image. Hello This is Pam from The Bugbytes - your sassylady designer today.Now this card is a bit interactive. 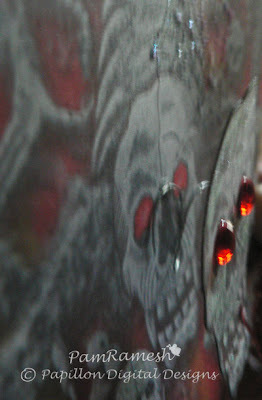 The skeleton head wobbles! My son loves interactive card so I had to add that part in. And so grossly amusing for him was that bit of spider dangling from the mouth! Boys! well guess I should say girls too as I found it grossly amusing too. The image itself is from Dover publications. I love these books and have tons of these books. Now this I think was a free sample image and of course I had to use my favorite toy to make this card - silhouette studio. Now the skeleton head I did not use the trace feature but instead just free hand added nodes and then manipulated the nodes and once I was happy used the crop feature and cropped the shape drawn with the image to give me that skeleton face. Then I just added a speech bubble filled it with grey using dropper to pick colors from the card image. I typed in Boo in grey blue and copy pasted it multiple times to form a pattern and then typed Happy Halloween. Similarly I did the Boo oval bubble too. 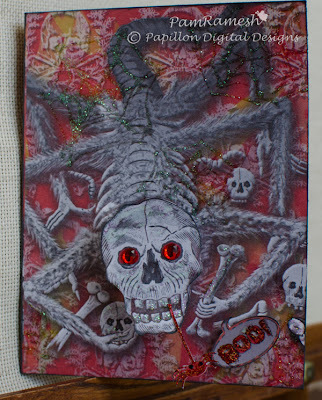 After cutting I took a small piece of jewellery wire wrapped it 4 rounds around a sharpie pen and cut it and attached the spring like wire to card (on top of the image where skeleton face is) using tacky over glue and then attached the skeleton head on the other end of wire. This is such an economical and a quick way to make your own wobbles. 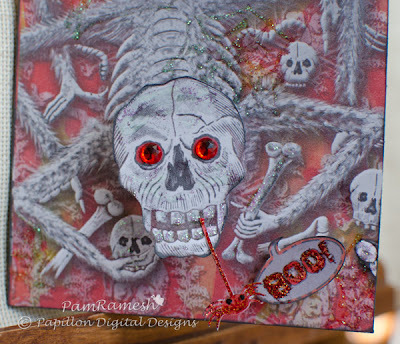 I then added red rhinestone to the eyes and some stickles to the teeth and spider and the word boo. 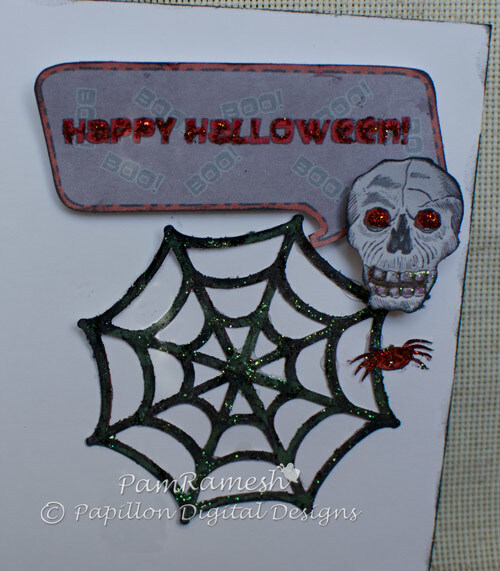 I also used white stickles to free hand some web shapes all over the front of the card just to add texture. I stuck the spider dangling from the teeth and used foam dots to attach the Boo shape. I added the stickled spider web and the spider on it and then with foam dots added in Happy Halloween and the skeleton face. So that's my simple Halloween card for my son. Thanks Sheila for having me as your designer. Wish you all a Happy Halloween in advance! Pam, you did an amazing job!!! 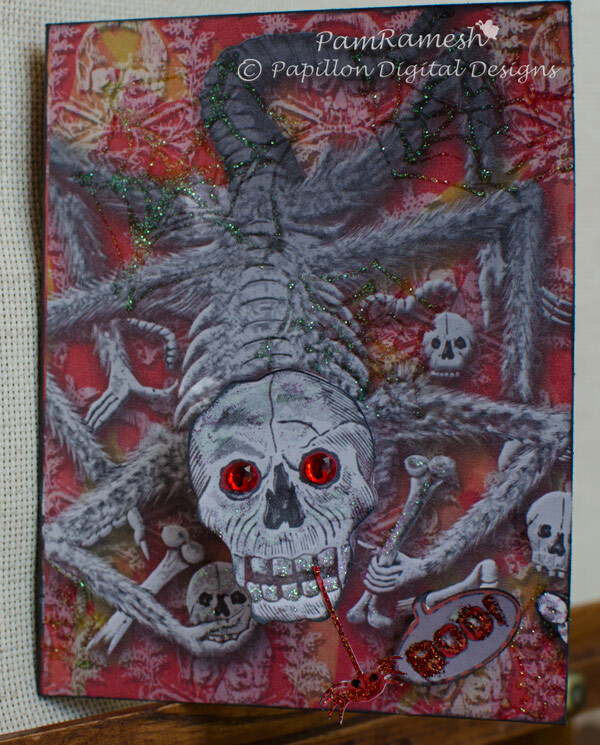 This is spooky, but what a fun-fun card!!! Love those eyes and it's soooo realistic looking! wow...scary ! LOL You did a fantastic job Pam. I bet your son loved that card !!! but I love it. So much fun. Thanks for sharing this great card and tutorial with us today at She's A Sassy Lady. Had to show my son....he loved it! Wants me to make a desk decor like it for his office! Thank you ladies. Oh yes my son loves it! Great work Pam - and really spooky!! Nicely done in a creepy sort of way lol. Love the wobbly head with the spider!! !